So, this outfit is totally inappropriate since we are expecting a foot of snow within the next 24 hours, but I can't express how excited I am for warmer weather! I snagged this maxi at a local discounted store and plan on wearing it non-stop this spring. I was weary of maxi's because of my height, but have become pretty obsessed with them this season. Are you following on Facebook?! "Like" VA Darling here. Also make sure to follow along on twitter & instagram. 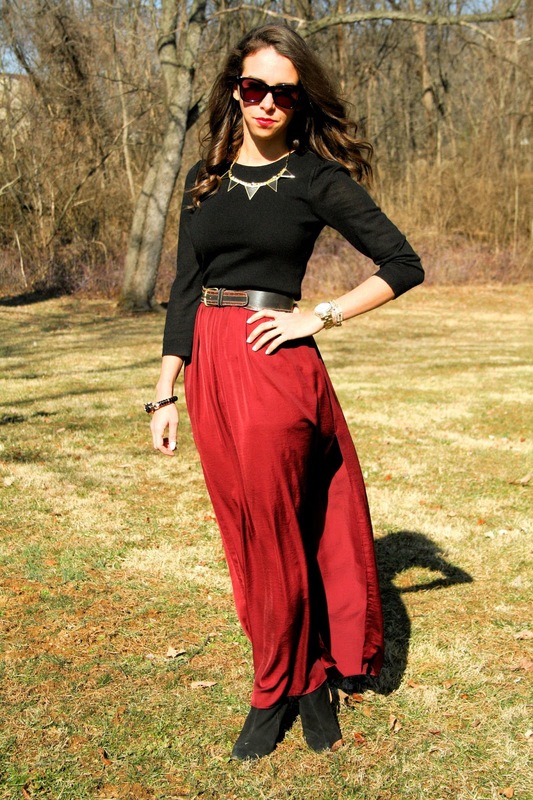 LOVE that red maxi skirt. It's gorgeous! Gorgeous maxi, babe!! But a foot of snow?? Hope that didn't happen... I'm waiting fro warmer weather too. ;) Have a great day! Thanks! the foot of snow happened but has melted already, so it isn't so bad!